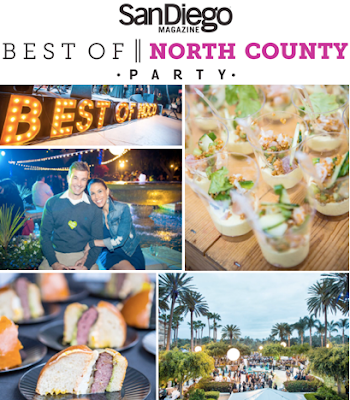 San Diego Magazine will host its annual Best of North County Party on Friday April 29, from 6:30-9:30pm at its new location - Omni La Costa Resort & Spa in Carlsbad. Guests are invited to sample North County’s best restaurants, breweries, wineries and spirit companies all in one place. We are raffling off 2 tickets to attend. Read on and be sure to enter. At a ticket price of $80, guests of the Best of North County Party can enjoy unlimited tastings and drink pairings. Live bands, DJ mixes, unexpected entertainment and a dance floor cap off an unforgettable evening. Save a few bucks and enter promo code BESTCOAST for $10 off per ticket. The party celebrates the annual Best of North County feature, published every year by San Diego Magazine in the April issue. The list of participating restaurants, breweries, wineries and spirit companies currently on board to offer tastings to the crowd of 1,500 guests include Addison Restaurant, Alpine Beer Company, Angel’s Salumi & Truffles, Barrel Republic, CRUSH Solana Beach, Culture Brewing Co., Davanti Enoteca, Flying Pig Pub & Kitchen, Gaia Gelato, Gourmet Mediterranean Chocolate, Green Flash Brewing Co., Hello Betty Fish House, Hungry Hawk Vineyards and Winery, Iron Fist Brewing Company, Lanai Island Grinds, Lumberyard Tavern, Mia Francesca, Monte De Oro Winery, Mother Earth Brew Co., Puesto, Pure Burger, Rancho Valencia, Sadie Rose Baking Co., Second Chance Beer Company, Slater's 50/50, Urge Gastropub & Whiskey Bank and many more. For more information and to purchase tickets, visit sandiegomagazine.com/San-Diego-Magazine/February-2016/Best-of-North-County-Party-2016, and check out the video below for scenes from last year's event.